One of the questions we get asked a lot has to do with gearing; how it works, what happens when I put this gear on that, can I get better runtimes if I change the gearing, etc. It can be a bit of a nightmare to figure out how best to gear your truck, but with a little math and a calculator, you can be a gearing expert in no time — or at least good enough to achieve what you're shooting for. I know, I know — the word "math" leaves a bad taste in your mouth, but this isn't high-level trigonometry we're talking about. Rather, if you can multiply and divide, and are familiar with how ratios work, you're fully equipped to handle the task. So grab your gears, turn on your calculator, and buckle in, because our first stop will be to look at some jargon and concepts you'll need to know before we really dive in. Everyone knows what a gear is, but "gearing" refers to the way that the individual gears work together to gain a mechanical advantage. One gear doesn't really do you any good by itself, and if two gears have the exact same circumference, they don't help out much, either, so for our purposes, gearing will refer to a collection of gears of varying sizes working together toward a common goal. The most common gears you can change on an R/C vehicle are the pinion gear, which is the gear directly connected to the motor's output shaft, and the spur gear, which is the main drive gear in a vehicle, and usually interfaces with the pinion gear (a pinion can also be a gear associated with a differential assembly, so make sure to use context to deduce which is being referred to). A differential is a collection of gears designed to allow two tires on the same axle to spin at different rates — check out this amazing video from the 1930's for more information on how differentials work; I've never seen a better informational video. A gear ratio is a measure of how many times one gear spins compared to another one (something we'll get into later). Gearing up refers to decreasing the gear ratio, and gearing down increases it. When we start discussing motors, we'll be referring to the Kv of the motor, which is a short way of referencing the motor's RPM per volt applied to the motor (when spinning without a load). The tooth count is how many teeth are on the gear, and the pitch of the gear refers to the number of teeth per inch of the gear's diameter. There are a few common sizes we use in R/C, such as 32-pitch (32P), 48-pitch (48P), and 64-pitch (64P). There is also a metric variant on pitch, the module, and the common sizes there are 1Mod, 0.8Mod, and 0.6Mod. It's worth knowing 32-pitch and 0.8Mod are the same thing, and can be used interchangeably. There are some that believe 48-pitch and 0.6Mod are also identical, but that is incorrect — while they may be very similar, over time you will notice some wearing on the teeth where they don't fit together exactly right. RPM and torque are inversely proportional; as one increases, the other one must decrease. The reason we use gearing in vehicles (both in real life and in R/C) is because of the inverse relationship torque has with how quickly something is spinning. Imagine that five-speed bicycle you had as a kid. When you put it in first gear, it was easy to peddle the bike, but you never got going very fast. As you went through the gears, you were able to go faster and faster with minimal additional effort, reaching top speed when you shifted into fifth gear. If you stopped, however, and forgot to shift back to first gear, if was nearly impossible to get going at all in fifth speed from a dead stop. This is gearing in action, providing you with a mechanical advantage, whether you wanted to use as little effort as possible to get going, or wanted to get the fastest possible speed. Aside from the fact most R/C vehicles don't have the ability to shift gears, the concept is the same. You would gear your vehicle one way if you want a lot of low-end power, like for a rock crawler, and another way for a super-fast speed run with a sports car. Finding the right gearing can be a lot or trial and error, but there are many advantages to having a proper gear setup. The best place to start is always the manufacturer's stock , or default, gearing set up. For the purposes of this article, we'll use a Traxxas Slash VXL 2WD truck, though the concepts we're discussing can be used on almost any vehicle. The stock gearing is important to know because it is useful to have a baseline to go back to in case you get too extreme in your gearing. Let's begin. 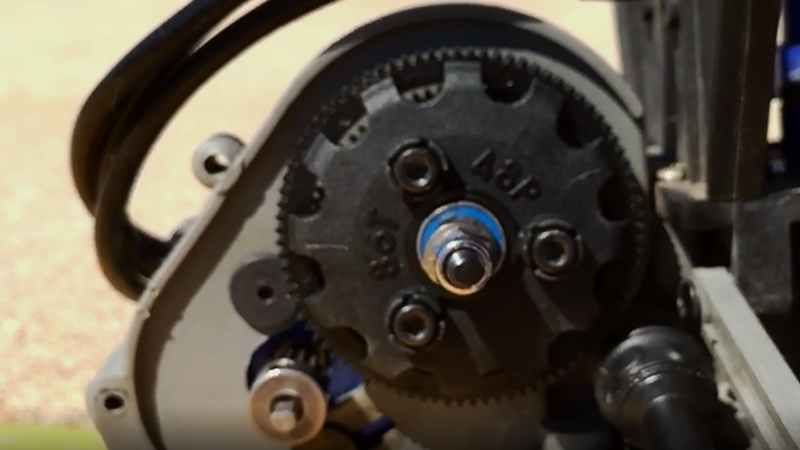 If you wanted to get more speed for this truck, you could either 1) increase the pinion gear's tooth count or 2) lower the spur gear's tooth count. Both of these options will decrease the low end power of the truck while simultaneously increasing the overall top speed. Conversely, if you wanted to gain more power, you could 1) decrease the pinion gear's tooth count or 2) increase the spur gear's tooth count. This tends to be the most difficult aspect of gearing for people to keep straight, and I find it helps to think of it in a relative fashion. The closer the pinion & spur are in tooth count, the higher the speed. The further away they get in tooth count, the higher the torque output. Thinking about it this way, it doesn't matter which gear you change - it's applicable to any vehicle, any gear pitch, and any tooth count. So if you wanted to get more torque and less top speed out of our example Slash VXL, you could either up the spur gear to the 90-tooth option Traxxas offers, or lower your pinion gear down to, say, a 20-tooth gear or any other tooth count lower than 23. We have to keep in mind the pinion and spur gears usually aren't the only gears in the vehicle. Sometimes there is a transmission, like our Traxxas Slash VXL has. Other times, there isn't a transmission per se, but maybe a couple of differentials and even a center differential as well. It all depends on the vehicle. We usually don't worry about the gearing of the transmissions and/or differentials, because they usually can't be changed — it's rare a company will offer multiple differential gears or transmission gears. So because the only modifications we can do to the gearing of the vehicles usually concerns only the pinion and spur gears, that's what we're focusing on. However, it's hard to have this conversation about gearing without addressing another major factor in determining your overall RPM: the motor. One of the more common aftermarket changes a consumer can make is switching out an electric truck's motor. Whether you want more speed, or more bottom end, the motor is another point of change when we're talking about RPM. However, changing a motor will sometimes also require you to change your gearing as well. Let's look at an example using our Slash VXL. Let's say we want to change our stock Traxxas Velineon motor out to something with a little more top end, like a Castle Sidewinder 4 with a 5700Kv motor. If we just swap motors, we'll certainly gain a lot of speed, but we also might have an issue with overheating due to the reduction of low-end torque. So let's try to find some gearing that gives us a little more speed, but also doesn't lose as much on the bottom end. We have to work out the math to determine our RPMs going into the transmission. We also need to know what battery we're using. For this example, we'll use a 2S 7.4v LiPo, which should be 8.4 volts when fully charged. We also need to know that, to figure out what the initial RPM without any gearing is, we need to multiply the Kv of the motor by the voltage of the battery. Once we have all four numbers (Motor Kv, Battery Voltage, Pinion Gear Teeth, and Spur Gear Teeth, we can calculate the RPM to the transmission. Now that we have the equation, we just have to pop our numbers in and determine the outcome. First the stock numbers for a base line. That increased the RPM by 4,942 overall; a sizable increase, but as I said above, the increase could lead to an overheating problem. If we wanted to increase our speed, but not as much, we'd also have to adjust our gearing. The chart to the right shows the RPM for each motor with different pinion and spur gear combinations. There are a few key takeaways here. First, it's notable that with just a change in gearing, you could gain almost as much speed with the stock motor as you could by changing to a new motor. The Traxxas motor (blue) with 30T/76T gearing is very close to the Castle 5700kv motor using the stock gearing of 23T/86T. Without doing the math on the gearing, someone might spend lots more money than they had to just to gain some speed. Second, the more appropriate gearing for the Castle 5700Kv of 16T/90T is practically identical to simply increasing the pinion gear a single tooth for the Traxxas motor. Based on the results from the gearing chart, there's no good reason to upgrade motors if speed is the only consideration, as you can mostly get away with just changing the gearing on a stock Slash VXL and achieve largely the same results. But let's say you had a Slash 4x4 and wanted to upgrade to a Castle Sidewinder 8th motor and speed control. This gets a little more complicated, because you're likely to also switch batteries as well, since the Sidewinder 8th opens you up to using higher voltage packs, which will in turn affect the calculations and final RPM. Let's calculate the gearing based on using a 4S LiPo, with a voltage of 16.8 volts when fully charged, and staying with the 2S LiPo for the stock Velineon motor. This works out to be very little difference between the two. If you drop the 2200Kv Castle Sidewinder 8th in your Slash 4x4, use stock gearing, and upgrade to a 4S LiPo, the performance will be almost the same as a stock truck with a 2S LiPo. This makes sense; you're nearly halving the Kv, but doubling the voltage — one basically cancels out the other. However, if you wanted to upgrade to a larger battery and larger motor, you're likely to have wanted some more speed and/or performance as a result. The nice thing about the Sidewinder 8th is the heavier-duty electronics and larger motor and both handle more heat, and dissipate the heat faster, meaning you can increase your RPM and not worry as much about overheating. In fact, the popular gearing for a Slash 4x4 with a Sidewinder 8th system is a 20T pinion gear and a 50T spur gear. This gives you plenty of speed, but still keeps the temps down overall. As with most things in the hobby, the key to gearing is a healthy amount of trial and error. What feels good to one driver might not be great for another. Experiment with your gearing. As long as you are paying attention to the temperatures of your motor and speed control, there isn't a wrong gearing. Play around and find what works for you!